Cauliflower loves spice and sweet-sharp flavours. Combined with chick peas and chicory, it makes a lively winter salad. 1. Mix all of the dressing ingredients with a good grinding of pepper; set aside. Bring a pan of salted water to the boil. Separate the cauliflower into florets and add, with the saffron (if using), to the pan. Bring back to the boil, cook for 1 minute, then drain well; cool. 2. 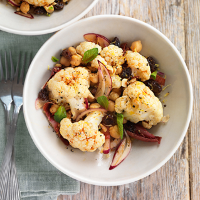 In a large bowl, mix together the cauliflower, chick peas, raisins and dressing; leave to marinate for 30 minutes. Cut the chicory widthways into 1-2cm slices and add to the bowl, together with the mint leaves and hazelnuts. Toss together and serve.